Our spring season begins with an exhibition that is exciting, fun and for a good cause! 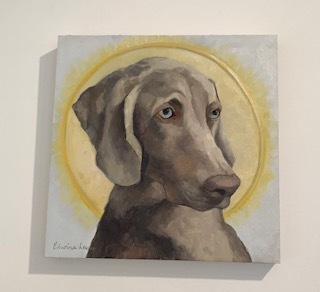 In Dog We Trust is a group show featuring artists with ties to the East End who share true love and respect for our animal friends. Ani Antreasyan, Jackie Black, Edwina Lucas, Kathryn Lynch, Kathy Rudin, Dinah Maxwell Smith, Billy Sullivan and Kamilla Talbot. To celebrate the lunar year of the Dog and to help the Animal Rescue Fund of the Hamptons we are donating 10% of the evening sales to ARF, whose primary purpose is to rescue and care for animals in dire needs. Their efforts to rescue animals from Houston, Miami, and Puerto Rico, were unprecedented. We are proud to partner up with this amazing organization for an evening of fun. Arf’s adoption van will be on the premises during the opening reception on MARCH 17 from five to eight pm.